Cover: The �upper� approximately two thirds of pea linkage group III, which displays a high correlation with chromosome 3 of Medicago truncatula. DNA sequences are known for nearly all the genes listed to the right of the major vertical bar, and those genes positioned opposite a hatch mark have been mapped in the JI1794 x Slow RIL population. To the left of the major vertical bar are most of the mutations that have been mapped to this linkage group although precise positions are known for only a few of these. None of the genes responsible for any of the mutations to the left of the bar has yet to be described. 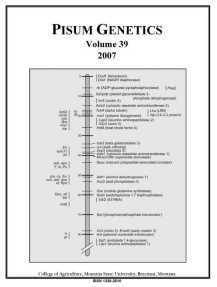 In this volume of Pisum Genetics both the review by J.L. Weller and the paper by V.A. Zhukov et al. on linkage group V describe how mutations in pea can be identified relatively easily by using the currently available partial genome sequence of M. truncatula. 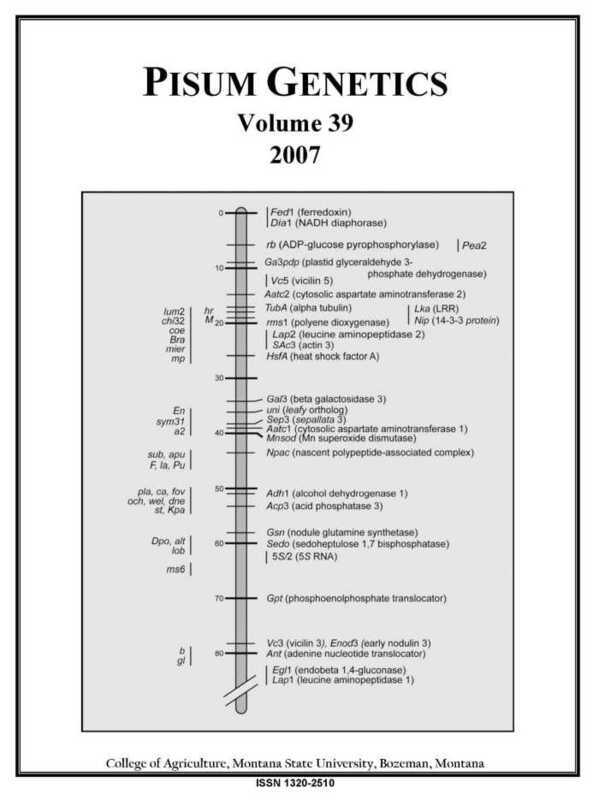 In the �Genome Resource� section of this volume, a table of the genes on M. truncatula chromosome 3 is presented, slightly rearranged to fit the known order of genes on pea LG III. Identification of most of the mutants shown on the cover should be relatively straightforward by searching relevant sections of the table for reasonable candidate genes and determining whether the candidate gene cosegregates with the mutation and exhibits an alteration in promoter or coding sequence in the mutants. A concerted effort involving the identification of such mutants would greatly augment the value of pea as a model system in legumes for many important traits. Nemankin, T.A., Shtark, O.Y., Zhernakov, A.I., Borisov A.Y. Cultural and DNA-based identification of Sclerotinia trifoliorum infecting chickpea in the U.S.